There are many types of street food vendors here in NY. They sell fruits, soft pretzels, hot dogs, toasted chestnuts and so on. We took a stroll down Fifth Avenue and Rockefeller Center, looking at the holiday decorations and lighting. My daughters bought some roasted peanuts from a vendor on the street. It reminded me of my growing up in Iran and the time that my mother would buy me fresh whole salted walnuts, grilled corn (balal) and warm and juicy cooked beetroot (laboo). Is it just my nostalgia that the food we ate seems to have tasted much better back then? Beets are an interesting root vegetable, they add so much color to your life! They color everything that they come in contact with including your hands and nails. I wonder if beets were used as make-up to color the cheeks and lips before modern times. 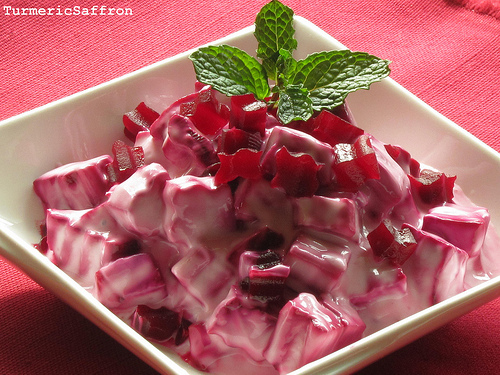 Cooked beetroot (choghondar) could be served sliced in salads, sliced or quartered with a dash of sugar, or mixed in with yogurt. The green part of it could also be used in the vegetable and been stew (ash). They add a delicious flavor to the stew, however, it is usually disposed of. That must be the reason behind the Iranian saying used when someone feels neglected, unappreciated or overlooked in decision making situations: "Am I a beetroot leaf here?" (pas man inja barg-e choghondaram?) ماست و لبو/ بورانی لبو Mast o Laboo/ Borani Laboo is a simple yet delicious side dish. Place the beets in a pan, cover with water, cook over medium heat for about an hour or until they softens. Remove the pan from heat and set aside to cool. Remove the skin, cut into small bite-size pieces or coarsely grate the beets using a food processor or a hand grater. 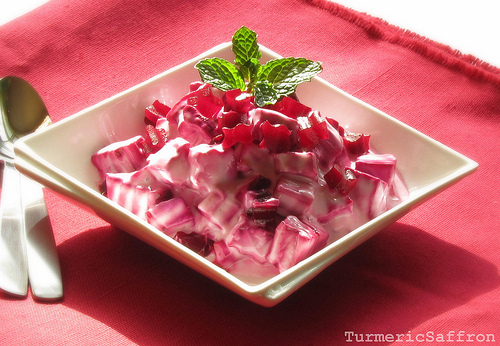 Combine the sugar, yogurt, beets and a dash of salt. Mix well. Refrigerate for a couple of hours. 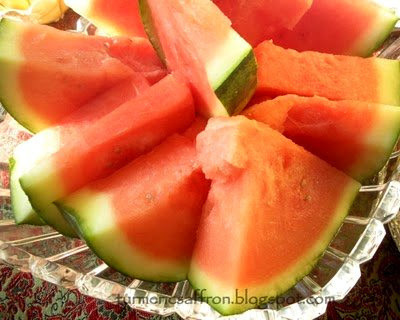 Persian Yalda Celebration: Celebrating The Longest Night of the Year! شب یلدا Shab-e Yalda (Night of Yalda) refers to the longest night of the year, the beginning of winter and the triumph of light over darkness. Monday, December 21, is the winter solstice (yalda) which has been celebrated in our culture for hundreds of years. 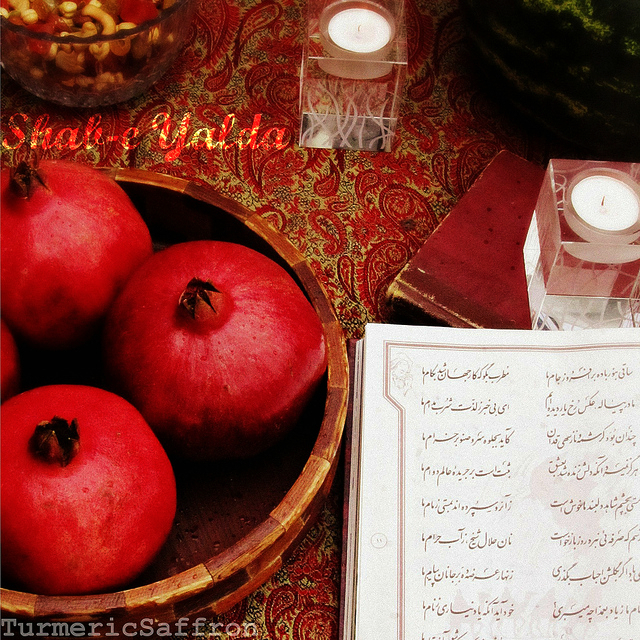 On the eve of yalda, families and friends gather together, stay up till midnight, tell stories, reminisce and read poetry while sipping hot tea and eating sweet watermelon, pomegranate and an assortment of nuts and seeds. It's a night that we take out the poetry book of Hafez and recite from it. Those who are familiar with Hafiz's poetry know that there's not a single translation that can capture its true meaning and essence. 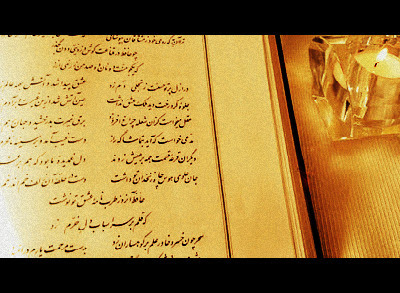 With that said, here's a translation of a verse by Hafez, one of the greatest Persian poets of all time. O pain the hidden secrets will become open debate. may we one more gaze upon that familiar trait. for compassion and kindness, it's never too late. with the aroma and the wine your senses satiate. one day bestow thy grace upon this mendicant's state. magnanimity the lot of friends, and wise foes try to relate. if this will not suit, don't stay mute, and transmute distastes of fate. life's alchemy, essence and seed, unimagined wealth shall create. Beloved turns stone to lave, and molten wax manipulate. then the Kingdom of the world, at your but prostrate. bearer bring good news, drunkards' wine consecrate. o untainted pure master, exempt us from this fate. I can't help but think about all those Iranians that kept these festivities alive throughout the centuries amidst the sometimes harsh and unfavorable circumstances. I owe every one of them a heartfelt thank you and gratitude. They have kept the hope alive and passed it on year after year. 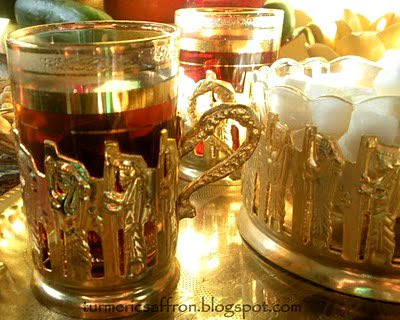 I hope to join in with all the Iranians, if not in person but in spirit, and celebrate the victory of good over evil. 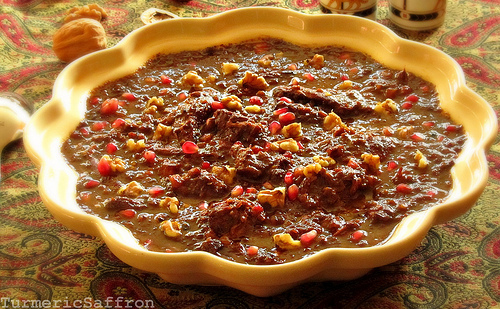 خورش فسنجون Khoresh-e Fesenjoon is one of the most delicious Persian dishes. 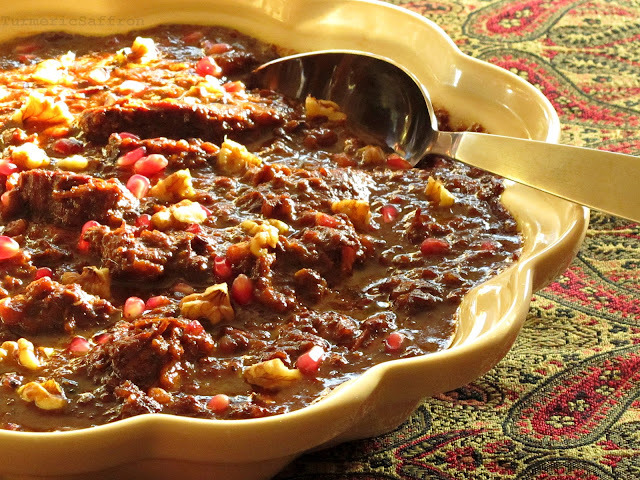 Biting into a tender piece of a well cooked sweet and sour chicken covered with tangy pomegranate and finely ground walnut sauce is to experience a piece of Persian culture, its food and heritage. In researching pomegranates, its history and its use in our culture, I've learned that it dates back to 3300 BC, here. 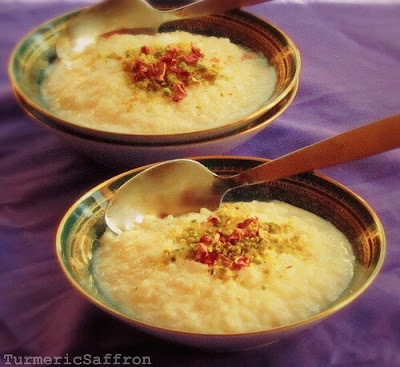 Fesenjoon is another example of Persian ingenuity in creating a well-balanced and healthy meal. I find the combination of all the ingredients in fesenjoon to be simply genius! Using fresh ingredients in Persian cooking is key. For many of us who live outside of Iran, finding the required and right ingredients is sometimes a challenge, one that we must learn to adapt to by using substitutes when needed. However, for this dish I believe all the needed ingredients are readily available here in the north east. One thing that I should mention is to use fresh walnuts, if possible. If you buy them readily packed in a bag like I do, at least check to see that the walnut colors are light and not dark. Dark colored and old walnuts taste bitter. Soaking walnuts for a few minutes in water or at least rinsing them before cooking improves the taste. 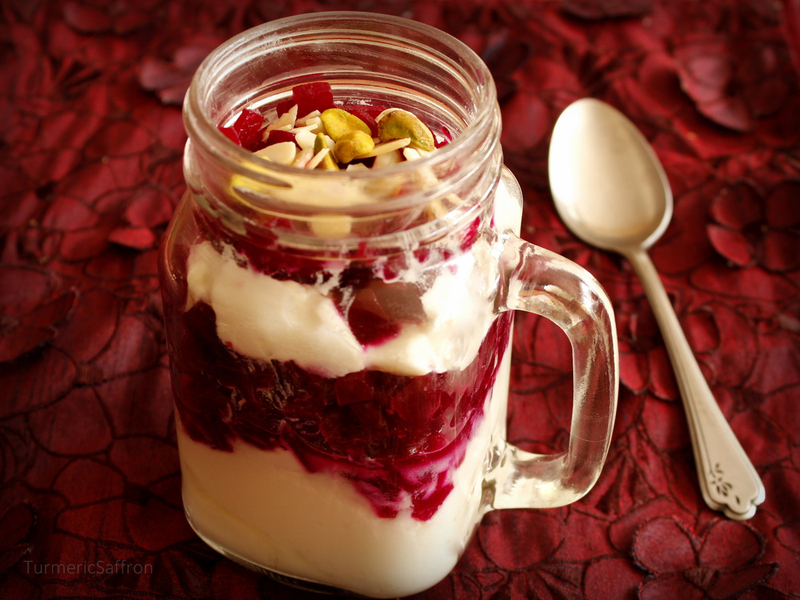 Another key factor is using the right pomegranate concentrate/syrup. 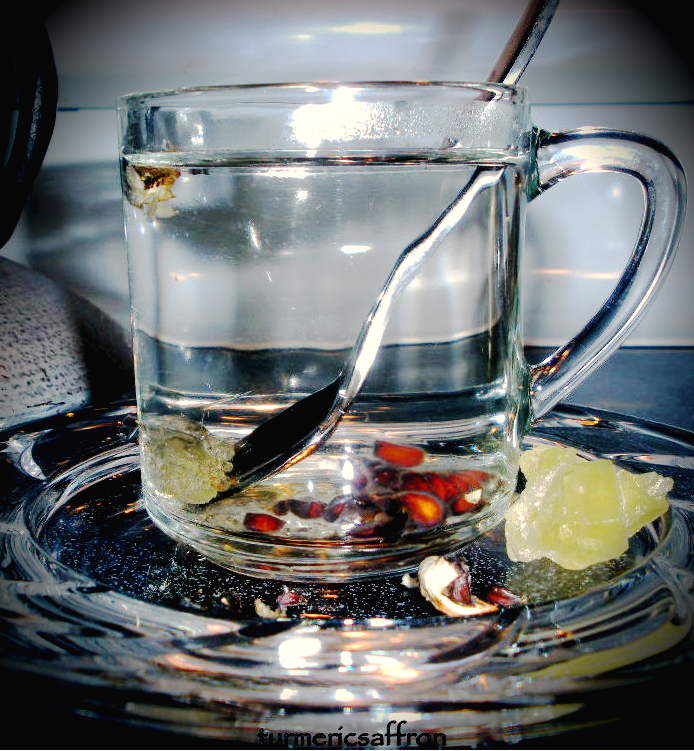 It should be of a thick consistency and not watery or mixed in with a sweetener. 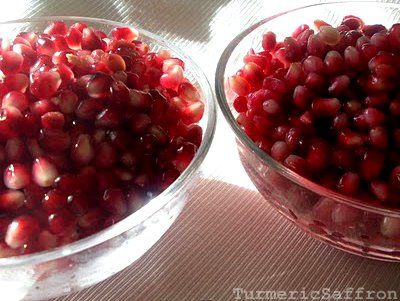 Don't use pomegranate juice instead. 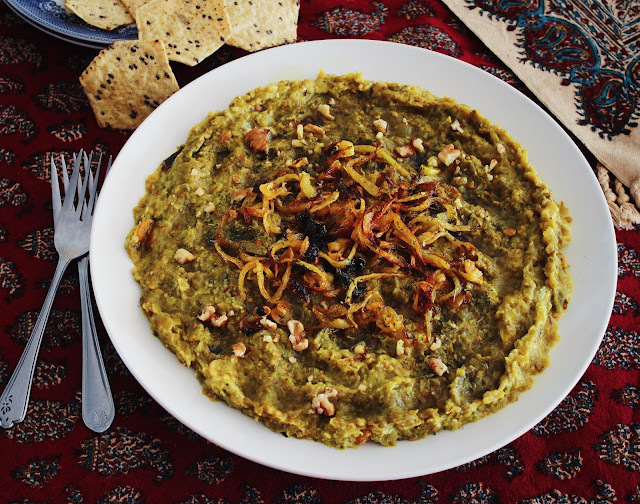 Fesenjoon doesn't require too many ingredients or prep time. It's a simple dish and it cooks fast. However, if you want to achieve that authentic and ancient recipe what it needs is patience. Khoresh-e fesenjoon has to be cooked on a low temperature/simmer setting for all the tastes to blend in and the walnut oil to be released gradually onto the stew. Sometimes, I may get a little carried away with my food decorations. I have to say that this dish doesn't need any props. When served with some aromatic white rice, the aroma, the look and above all the taste will speak for itself. 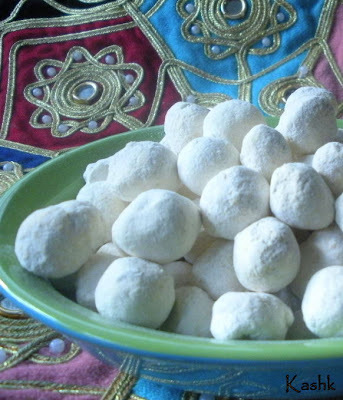 Here's a recipe link for Fesenjoon with Meatballs. You may chop the walnuts as finely as possible or pulse them a few times in a food processor. In a small pan add two tablespoons of oil and saute walnuts until lightly toasted for a minute or two over medium heat, stirring frequently. Add the pomegranate molasses and 2 cups of water, mix well, cover the pan with lid slightly ajar and simmer for 30- 40 minutes on low heat. In a large heavy pot, saute the onions in 2 tablespoons of oil over medium heat until golden brown, add turmeric and stir well. Place the chicken pieces into the pot and cook until golden brown on all sides, add salt, pepper and a small dash of cinnamon. I usually add 1/2 teaspoon of salt in the beginning which later on can be adjusted and a dash of pepper. This is not a hot dish. Pour the pomegranate walnut mixture into the pot, mix well, add additional water if needed, chicken pieces need to be covered in liquid, bring back to a boil. Then lower the heat, cover and simmer for two hours. The slow cooked chicken, walnuts and pomegranate sauce will be rich and creamy. Add 1 tablespoon of sugar at a time, mix it well without shredding the chicken. Taste and add more sugar if you like it more sweet. 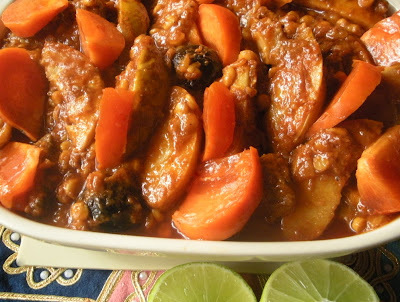 Khoresh fesenjoon is a well-balanced, sweet and sour (malas) dish. I, personally, like it more on the sour side. But that's just me. The majority of people that I know like it more sweet than sour. If fesenjoon is too watery and not of a thick consistency leave the cover a little ajar, to let the steam and moisture out and simmer more until it thickens. Fesenjoon should not be watery. Serve hot with aromatic basmati rice. If there are any leftovers, freeze them! Leftovers taste good too. I like autumn mostly for its beautiful color changing foliage, crisp weather and also for its seasonal fruits such as pomegranate, persimmon and quince. Quince is one of my favorite fall fruits. Of course, quince is basically used in cooking and making مربای به quince jam and is one of those kinds of fruits that all parts of it is edible. It also has a warm and happy color too. I'm so tempted to take a quince with me to the paint store in my neighborhood and have them find the exact matching color. In the spring I am thinking of painting my kitchen quince yellow if there is such a color. Anyhow, for this dish after washing and patting it dry, you can just slice it into wedges and there is no need to peel the skin off. 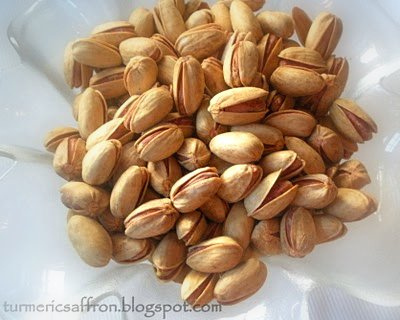 In Iran the seeds are also used for treating coughs and chest pains by brewing them for few minutes. خورش به Khoresh-e beh is a very tasty dish and very pleasing to the eye also This dish is a combination of meat (beef or lamb), yellow split peas, tomato sauce, and quince. 4 medium-size quince, washed, cored and sliced (could be cubed too), slice right before cooking. Heat 3 tablespoons oil in a large heavy-bottomed pot over medium-high heat. Add chopped onion and cook until golden brown, add turmeric powder and stir. Place the meat in the pot and brown on all sides. Add the tomato paste and cook for five minutes. Stir. Add the peas to the pot and give it a gentle stir, cook for 3-5 minutes. Add cinnamon, saffron, dried lemons salt and pepper. Pour water in the pot, bring to a boil, then lower the heat, cover and cook on a medium to low heat for an hour. Heat 2-3 tablespoons of oil in a skillet and cook the slices of quince for 7-10 minutes over medium heat. Sprinkle sugar over quince slices and stir well till sugar is completely dissolved. Set aside. 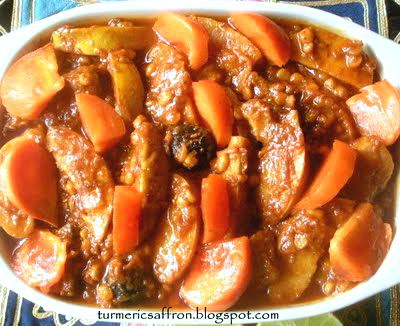 In an ovenproof casserole dish, pour in the meat mixture, adjust the seasoning and gently layer the cooked quince slices on top. Cook in the 350 degrees Fahrenheit preheated oven for 50 minutes. 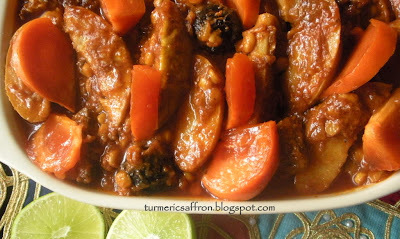 * I garnished the stew with some slices of a small and ripe khormaloo (persimmon). Today is my first blogoversary! Food blogging has been a journey as well as a healing process for me while I've been chopping onions, frying eggplants, pickling garlic, steaming rice and grounding threads of saffron and the whole lot of other things that cooking entails. I had started this blog exactly a year ago as a tribute to my late mother who had passed away six months prior due to an illness. This was my tribute to her amazing culinary capabilities, her knowledge and the understanding of all the ingredients used in Persian cooking. She loved serving up delicious food with a welcoming attitude and the constant desire to feed and include everyone. Little did I know that through it all I would become a more passionate and enthusiastic foodie myself. I have grown to appreciate food more than ever. It is no longer about preparing meals for my loving family but becoming curious about food and nutrition and exploring other ethnic cuisines from around the world. From the very young age of eight or nine when my mother taught me how to saute onions, an essential in Iranian cooking, my love affair with food began. My mother loved talking about food as much as she enjoyed preparing and eating it. She'd tell you the benefits of every ingredient as she would feed you. She was not shy about giving strangers tips on how to cure their ailments by using herbs and spices. We'd grown up hearing stories about how she had helped cure our next door neighbor's liver problems by sending over some sumac(somagh) to take as a medicine. Or, telling someone else that they should drink a glass of warm yogurt drink (doogh-e garm) before going to bed to help them with their insomnia! The first few months of blogging was more about documenting what I had learned and remembered. I was frantically posting without enjoying it much. It was more of a chore I felt had to be done; that it would somehow make my mom happy to know that her legacy would be passed on. To my astonishment, I have grown to enjoy and love to write about my recipes, read other amazing food blogs and marvel at their food photography.What had started as a homage to my beloved mom has healed me through my writing about the kinds of food she'd serve us ever so graciously and lovingly. کشک بادمجان Kashke-e Bademjan is the quintessential Persian appetizer. 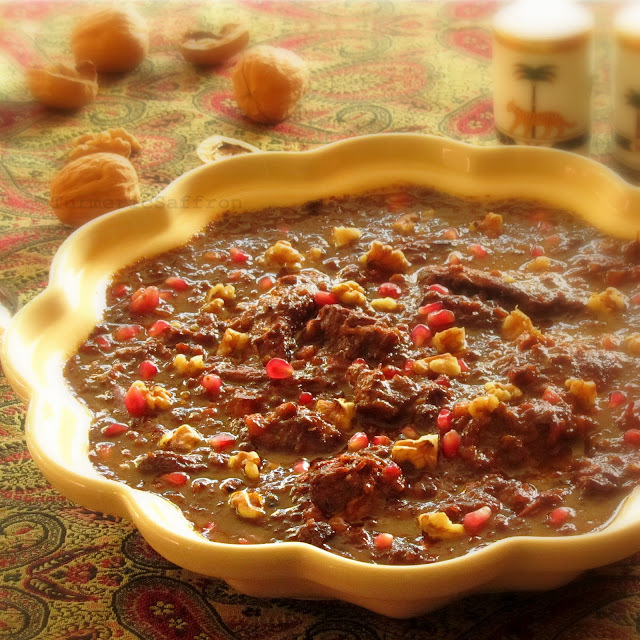 It may be not be considered a main dish, however I feel once you serve kashk-e bademjan you don't need much of any thing else on the table. Except, some warm lavash (flat bread), a fork and a tall glass of cool water. If you haven't tasted it yet, try it. You'll be surprised how tasty this combination of eggplants, whey (kashk), caramelized onion and garlic can be. So simple and yet so tasty. 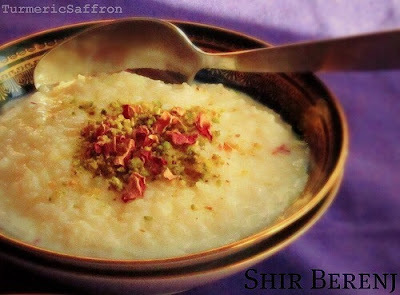 This is also a perfect dish for those that say Persian cooking is too time consuming. 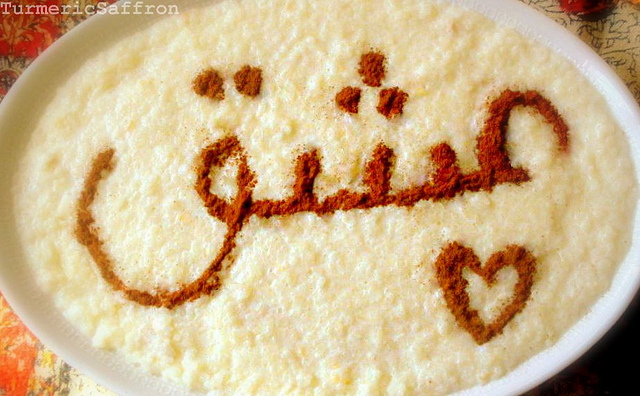 1 cup liquid kashk (whey), it can be found at Iranian or Middle Eastern grocery stores. Using a knife make some cuts in the eggplant to let the steam out and place them onto the baking sheet. Roast in the preheated oven until softened for about 30 minutes. Remove from the oven, set aside to cool. Remove the skin, cut the eggplants into small cubes. Heat 3 tablespoons olive oil in a large skillet over medium heat, saute the chopped onions until golden, add the turmeric powder turmeric and stir. Add the garlic and the dried mint, saute for another 5 minutes. To the skillet add the chopped eggplant, saffron, salt and pepper. Cook for 10-15 minutes over low heat. Pour the kashk ( liquid whey ) over the eggplant mixture. Stir. Cook for 2-3 minutes on very low heat for the flavors to come together. Adjust the seasoning and serve on a platter, add extra kashk if you prefer. 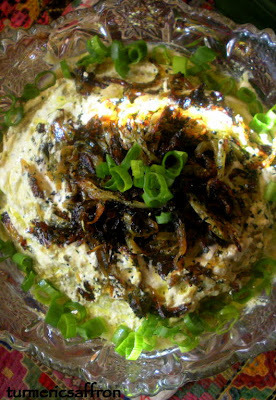 Garnish with fried onions and chopped walnuts. 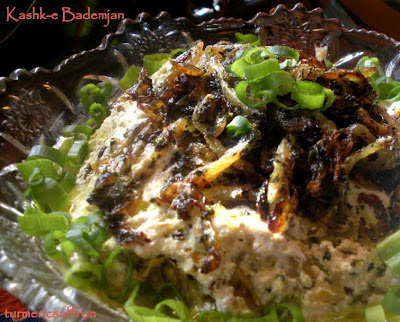 Kashk-e Bademjan can be made the night before and served at room temperature with warm flat bread or pita chips.